Conspiracy theory website, The Free Thought Project, got trolled by SoFlo when that notorious Facebook content thief posted his iPhone hack hoax. Not only did they fall for his hoax, they crowed about how “the FBI looks silly now”. Well, it looks like they will have to eat crow now! If Matt had only done a quick Google or YouTube search, he would have found our debunking article or videos in less than 5 seconds. But no, an experienced “journalist” like Matt Agorist has no need to fact-check. I suppose he was trained in the “I will just wing it on my gut feelings!” School of Journalism, or “Trust your feelings…” College of Journalism. Guess who looks silly now? 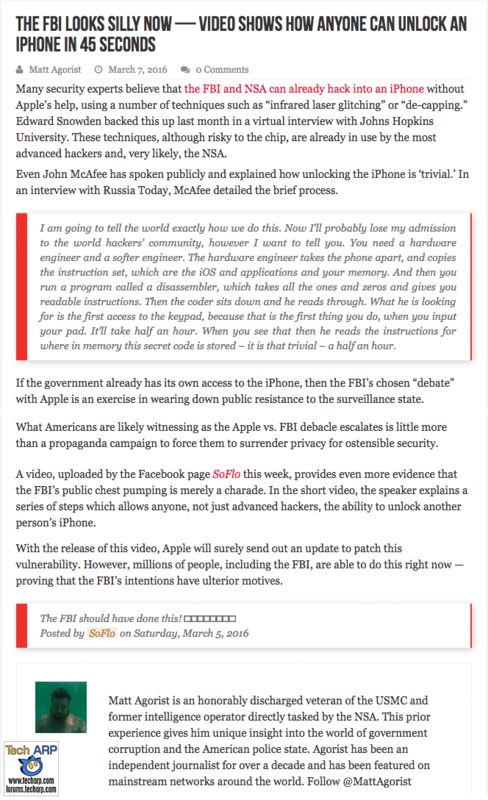 Let us give Matt and the Free Thought Project a short briefing on the fake SoFlo iPhone hack. For the full details, you can read our two-page article here. The fake SoFlo iPhone hack was based on a flawed demonstration of the iOS 9 Siri bug from September 16, 2015. It would never have worked the way he demonstrated it. That iOS 9 bug required Siri to be enabled. If Siri is disabled, the bug cannot be exploited and is completely irrelevant. A successful exploit of the Siri bug only allowed access to the Contact List and Photo Library. It did not allowed access to the Home screen, or other areas of the iPhone. The iOS 9 Siri bug was fixed a week later, on September 23, 2015. By the time the San Bernardino attack happened on December 2, 2015, iOS 9 had already been patched 3 times. Either one of those 3 patches would have closed the iOS 9 bug. The iPhone 5c used by the San Bernardino shooter, Syed Rizwan Farook, is the same model we used in our proof video. Once it’s patched, it’s impossible to get in using the bug exploit. Perhaps Matt or the Free Through Project will retract his article, or post a correction? Nah, we didn’t think so. Conspiracy theorists are never wrong. Their mistakes are really just another conspiracy to shut them up. Incidentally, while disproving the SoFlo iPhone unlocking hoax, we stumbled upon a Clock Share security bug in iOS 9.2.1, which could be used to bypass the iOS device’s passcode or Touch ID. We, of course, reported it to Apple and it was fixed in iOS 9.3.